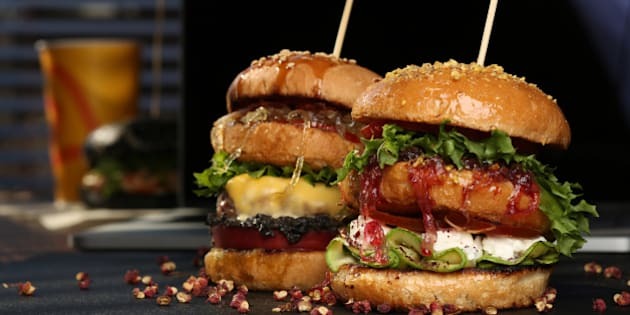 Meticulously searching for the perfect burger restaurant in each Canadian province and territory was no small feat, but the Deal Experts at Travelzoo have done it.... In honour of Hamburger Day 2016, here is a list of some amazing burger joints from coast to coast. Meticulously searching for the perfect burger restaurant in each Canadian province and territory was no small feat, but the Deal Experts at Travelzoo have done it. The restaurants on this list elicit pride in their province or territory, uniting their patrons through their different takes on the hamburger and their dedication to great food and great service. Whether they offer a classic burger, an innovative burger, or an "I can't believe someone came up with this recipe" burger, most of these places are award-winning, and have even garnered international media attention. In honour of Hamburger Day 2016, here is a list of some amazing burger joints from coast to coast, and our top picks from each menu. Warning: These images may cause mouth-watering or sudden cravings for burgers. Since 2013, Naina's mouth-watering burgers have been winners or runners-up at the Alberta Burger Fest (formerly known as YYC Burger Week). This burger joint was also mentioned on "The Social," and was featured on the popular show "You Gotta Eat Here!" Every week, Naina's Kitchen features a "Stuffed Burger of the week" including the Pancake Breakfast Stuffed Burger, Donair Stuffed Burger, and Spaghetti Stuffed Burger. A ½ lb of lean beef stuffed with local Saskatoon berries, cayenne candied bacon, creamy Havarti cheese and then topped with more candied bacon. Dressed with lemon-minted mayo and a house made berry quark. Romer's prides itself on its local cuisine, sourcing its organic meat and most of its other ingredients locally. All their draft beers come from the best Vancouver micro-breweries. With four popular locations in BC, Romer's was featured on "You Gotta Eat Here!" Housemade pork sausage patty, maple-smoked bacon, fried egg, crisp iceberg, sweet onion, vine-ripened tomatoes, bacon and chipotle aioli. Nuburger (Formerly Unburger) is a burger joint on the quest to eliminate the "Burger Hangover" (the guilt and the gut that ensue after eating a greasy burger). Nuburger focuses on balance and nutrition. They created their own tasty sauces with less oil, salt and sugar, while still piling on fresh, wholesome toppings and using locally raised grass-fed cattle. Clearly their formula has been a hit, as they now have two locations open in Winnipeg. There were also featured on "You Gotta Eat Here!," AND won the Le Burger Week competition in 2013, 2014 and 2015! Homemade Asian slaw, goat cheese, "hot damn!" mushrooms and low fat sweet chili mayo. The Gr8ful Spud is known for its wholesome comfort food, particularly their specialized poutines, but the quality of their burger is not up for debate either. The atmosphere is welcoming and alternative, and the place is known for the servers' friendliness. Check it out and try some of their poutine too! Juicy six-ounce house-made burger topped with mayo, burger sauce, oyster sauce, pickles, tomato and onions. This gourmet burger brand prides itself in giving its customers the "burger experience," while being innovative and using French culinary techniques to offer great flavours. Each Relish location has a featured burger on the menu that is unique to that community. Not in New Brunswick, but want to relish these delicious burgers? There are also locations in Vancouver, Edmonton, Halifax and St. John's. Fried bologna, pickle chips, sauteed onions and mustard. This Moncton gastropub, named one of Canada's Top 50 restaurants by Maclean's Magazine, and featured on "You Gotta Eat Here! ", offers a lot more than just burgers, but The Burger is a big hit. House-ground brisket and bacon, brioche bun, dijonaise, tomato, pickle, old cheddar and caramelized onion. Plain and simple, Darrell's is a family run restaurant with a strong presence in the Halifax community, serving everyone including students, professionals and families. Since 1992 Darrell's has been a Halifax staple for excellent food, service and atmosphere. It is no wonder that the restaurant and its food have won so many awards! While you're there, treat yourself and order one of their award winning milkshakes. A traditional BLTCM burger with that "stick to the roof of your mouth" difference. The Burger's Priest calls itself a classic American cheeseburger joint "redeeming the burger one at a time." They believe in keeping it simple and fresh, and griddling their burgers to perfection. Their menu offers the tasty, good-quality basics, but if you're looking for something that goes above and beyond, make sure to check out their Secret Menu... You won't be disappointed. Rather than being sandwiched between two regular buns, this four-patty burger is held together by two grilled cheese sandwiches. Enough said. Brickhouse Kitchen and Bar created PEI Burger Love's Most Loved Burger 2016! Brickhouse aims to support local while ensuring the sustainability of the island and its surrounding waters. The architecture of the Brickhouse is also worth checking out, built in the mid-1800s by Daniel Brenan, one of PEI's best-known citizens at the time. Jukebox Burgers prides itself on exceeding the expectations of a typical burger joint, with daily in-house, freshly ground beef, fresh buns baked daily and hand-cut potatoes. Their hard work has earned accolades and features from Today's Parent, Epic Meal Time, Global news and more. The restaurant's fun, vintage decor makes you feel like you're in a classic burger shack, but the service and quality of food are far from ordinary. Mayonnaise, lettuce, fries, homemade gravy, cheese curds. How could we feature Montreal without mentioning poutine? With 24 per cent of the votes, the Harvest Eatery and Fresh Market won CBC Saskatchewan's poll for the best burger in Saskatchewan. Harvest Eatery is known for its friendly owners and unique twists on some classic dishes. Ranch-house, all-beef burger, Harvest Sauce, aged white cheddar, vine-ripened tomato, butter lettuce, pickled red onions, maple bacon, sesame brioche bun. Krista Pereira is a Travelzoo Deal Expert based in Toronto. Travelzoo has 250 deal experts from around the world who rigorously research, evaluate and test thousands of deals to find those with true value.